Soft-Kut Printing Blocks are approximately ¼" thick — enough to allow both sides to be cut, thus providing two printing surfaces per block. Cut any size block into smaller pieces with scissors, a knife, or a paper trimmer to use it for rubber stamping! 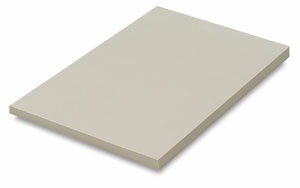 Soft-Kut Printing Blocks are also latex free. Soft-Kut Printing Blocks are meant for use with water-base block printing inks only. Solvents will ruin these blocks. Shipping note — The Paoli Clay Company distribution center was hit by a flood, damaging some of their stock of Soft-Kut Printing Blocks. This caused a halt in their production, which may result in backorders. Blick is working to process orders of Soft-Kut as quickly as possible. ® Soft-Kut is a registered trademark.